We provide 100% land and build funding for property developers. We know that good developers often have more opportunities than they have funds. 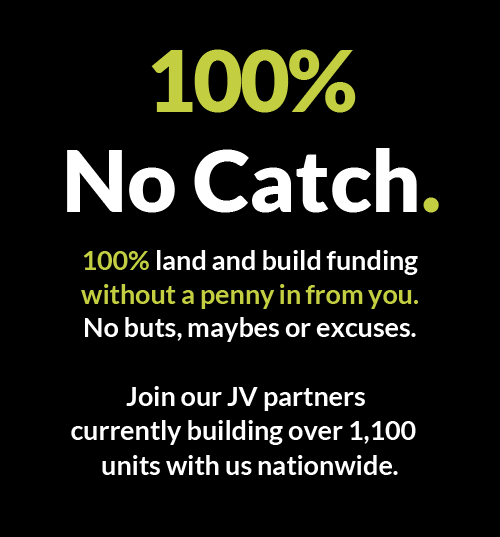 We provide 100% funding for property developers. Our business is privately owned and funded, backed with capital from the Chairman’s family office and a trusted partner. We have no shareholders or external board members and this unique way of funding enables us to make quick decisions in a flexible way, the complete opposite of our ‘computer says no’ competitors. Yes, it really is 100%, without a penny in from you. As we pay stamp duty and soft costs, we cover over 100% on day one. No banks, no crowdfunding and no ‘peer to peer’. In using our own substantial capital we make decisions quickly – and stand by them. Our team are highly skilled and experienced. Working with you, we ensure that your project is successful. We take the strain and drain of VAT returns and the relentless stream of admin. No late nights or lost weekends. We are on permanent standby for you. Unlike many conventional funders, we won’t interfere. We’re property experts and here to help at every stage of the process, from start to finish. We are proud of our outstanding track record and have a reputation of being easy to do business with. It’s one of the many things that makes us special. Go Develop is the ‘one-stop-shop’ solution for property development, land and build. Watch our video here, follow us on our social media channels and find out more about our 100% funding model. Always easy to do business with.